Curse of the Ice Dragon has arrived! Born with mark of the Mighty Hunter, Markus saves his village from the brink of starvation –for whenever he releases an arrow, his aim is true. But despite his skill and strength, Markus is unable to confront his tyrannical father. Shamed by his cowardice, he distracts himself by needlessly shooting the forest creatures. When Markus takes no heed of the village prophet’s warning that his actions will attract The Hunter’s Curse—for every animal Markus kills, his loved ones will suffer the same fate—the Sky Goddess unleashes her ice dragon. Now, Markus must flee the dragon without killing it … or his beloved brother will be the next to die. Download on Nook and Kindle. Print and iTunes copies should be available next week. With a tentative step onto the vast, frozen wasteland, Markus gingerly made his way across the ice, pick in hand in case he fell through a crevasse. Scaling ice was difficult enough without a monster in pursuit, but he felt comforted in the knowledge that the dragon would not possibly be able to sustain her weight on the ice. If the beast continued to pursue him, she would surely fall through and he would be spared her threat. Markus smiled at the thought of Lydra plummeting into the abyss. He’d seen it happen once to a herd of elk that had chanced upon a lake during the first freeze of winter. A young hunter then, he had been stalking these animals one morn when they caught scent of him and rushed onto the frozen lake. Foolish they were to try to cross. They would have fared better facing down his arrow. In an instant, the elk all perished, sucked down through a break in the ice. Walking gingerly, yet swiftly with numbing feet was proving a difficult task. Markus tried to stay on the higher ridges, avoiding the pits of sunk-in snow. Mayhap traversing the glacier with the thaw of winter was safer. After all, he could clearly see the sinking snow holes, which he knew to be crevasses. His walk became brisker, more confident. The dragon would not be able to maneuver this glacier with her large, clumsy body. Ca sting another glance behind him, Markus almost stumbled over his own feet. He gazed in horror at Lydra sitting perched at the cusp of the glacier, blowing a long curtain of ice in front of her. With a deep intake of breath, the beast’s chest ballooned before she blew out another stream of ice, frost dripping off her fangs with each hiss of air. She was making the path thicker and impenetrable. She was building a bridge across the glacier! Looking up from her perch, Lydra leveled Markus with a crimson, sinister glare. Swallowing a lump of fear, Markus struggled to breathe through his constricting lungs. This was no dumb animal. Nay, Markus was the fool. He had considered himself safe on this glacier, but he had proven himself to be no more intelligent than an elk. Lydra did not try to traverse the ice bridge on clumsy legs – she used her belly instead. The shimmery scales that coated her distended stomach must have been smooth as well, for she slid seamlessly along the surface. When she reached the end of the bridge, she stopped herself with the tips of her long fangs and stood up before blowing yet another bridge of smooth ice across the glacier. Turning, Markus picked up speed, knowing that with his weighted, frozen feet, he put himself at greater risk of falling through the ice. But he had no choice. The dragon would be upon him before he crossed to the mountain. With his quickened pace, he narrowly missed several crevasses. The dragon had come so close to him now that he could almost feel its frozen breath at his back. Categories: books, news | Tags: archery, Curse of the Ice Dragon, dragon, fantasy, fantasy novel, goddess, magic, tara west, witch, wizard, ya fantasy | Permalink. 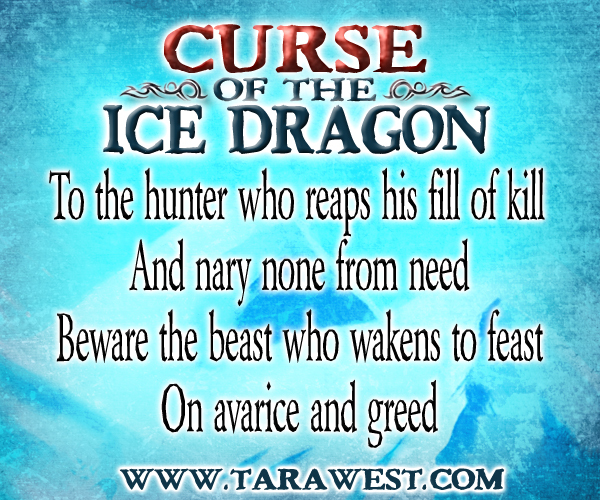 Curse of the Ice Dragon available next week! Finally! 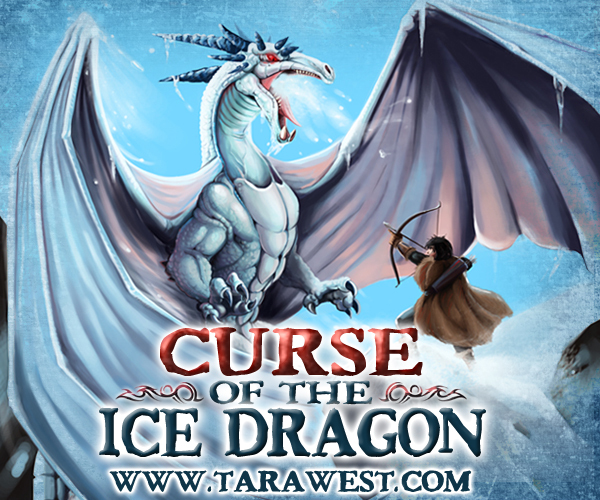 Curse of the Ice Dragon will be out next week. Here’s a scene with Madhea, the evil sky goddess who cursed the boy hunter, Markus. Under the mystic glow of pale lights, Madhea sat on her ornate ice throne, looking down into the swirling mists. Try as she might, she could not summon forth an image of her dragon. Lydra was lost for now, trapped under the crush of heavy snow. The foolish beast had failed her. Cursing, she slapped the vortex of spinning vapor, scattering wisps of clouds across the stones. Madhea was tired this night and her magic was draining, but she needed to know what had become of the boy. With one final attempt, she spun her hand around the circle of stones beneath her, calling forth her vision spell until a faint image of the boy hunter appeared. He looked too much like his father, with coarse midnight hair and a thick, square jaw. Her wingtips twitched and hummed as her mind conjured up images of the one night she’d spent in the cradle of Rowlen’s strong arms. Rowlen, why did you leave me? “Lydra is trapped, My Deity.” Her servant, Jae, a beautiful girl with long coppery curls that fell just below her waist, stood at the threshold of the throne room, her feet obscured by a soft fog rising from the floor. “Yes, I know about the dragon,” Madhea answered flatly, as her wings drooped at her sides. Unable to mask her annoyance, Madhea waved away the servant with a flick of her wrist. Jae stood grounded to the spot while she leveled Madhea with the direct gaze of her tapered amber eyes. The girl was bold. Her insolence would have to be dealt with — soon. Madhea knew it was her beauty that made the servant so. She too had been that way once, when the allure of her ivory hair and vivid green eyes were matched by no woman. Madhea had been a youth then, though it seemed only a few winters ago. But, once her heart had been shattered into a thousand splintering ice crystals, her beauty died with it. Her death from within, from the plague that ate at her soul, crept outward, gnawing at her flesh until naught was left but the wrinkled skin of an old woman. But Madhea had had her revenge — the curse she put upon Rowlen’s heart before he descended. His young bride and sickly son did not know he would return a monster. Now that he was dead, the last remnants of Madhea’s heart had withered to dust. But she would mourn silently. The Elementals need not gain another reason to doubt her powers. “Do you wish me to release the pixies?” asked Jae, waving a hand toward the dark, deep void in the wall behind Madhea’s throne. Upon hearing their names, an eruption of squeals began. Thousands of pixies, each no bigger than a child’s fist, screamed from behind an iron grate for their release. “No, girl.” Madhea leered at her servant from beneath pale lashes and silenced the pixies with a wave of her hand. “Do you dare tell me what to do?” Rising, Madhea slammed her fists against the stones. The girl worried for nothing, brainwashed by the Elementals of the ice coven. Madhea knew her magic was not waning. The ice was not melting. Her towering pillars of frozen crystallites had withstood over ten thousand winters and they would protect them for thousands more to come. “Forgive me, My Goddess.” Casting her gaze downward, Jae bit her lower lip. Categories: books | Tags: Curse of the Ice Dragon, dragon, epic fantasy, literature, myth, tara west, ya fantasy, YA novels, young adult book | Permalink. 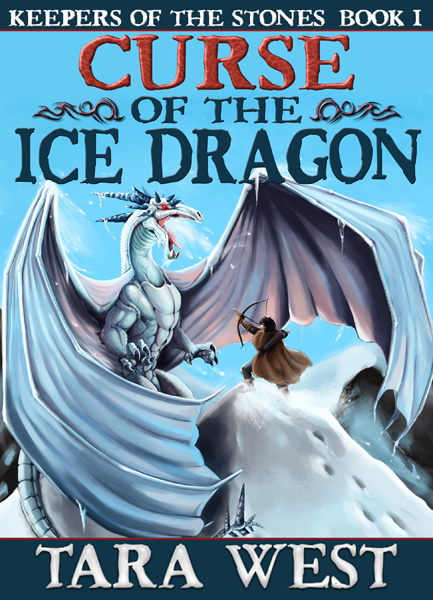 After several more rounds of edits, Curse of the Ice Dragon is with the formatter and should be uploaded this week. It will be available on Kindle, Nook, itunes and in print. Categories: books | Tags: Curse of the Ice Dragon, dragon fantasy, dragon novel, fantasy, Hunter's Curse, keepers of the stones, sky goddess, tara west, ya fantasy | Permalink.